Kesmas: National Public Health Journal as the name change of Kesmas: Jurnal Kesehatan Masyarakat Nasional is a journal published by Faculty of Public Health Universitas Indonesia since August 2006 and has been accredited by Ministry of Research, Technology and Higher Education July 2009 then re-accredit in 2012 (No.56/DIKTI/Kep/2012) and 2018 (No.30/E/KPT/2018) with Second Grade (Peringkat 2, Sinta 2) valid year 2017 - 2021. Our journal is published quarterly on February, May, August and November. Kesmas: National Public Health Journal is on public health as discipline and practices related to preventive and promotive measures to enhance health of the public through scientific approach applying variety of technique. This focus includes area and scope such as biostatistics, epidemiology, health education and promotion, health policy and administration, environmental health, public health nutrition, sexual and reproductive health, and occupational health and safety. Kesmas: National Public Health Journal was first published every two months since August 2006 with 50 pages in every edition and purple cover. Then from August 2012 to February 2014, our journal was published monthly and orange peach cover with picture. Due to managerial restructuring since May 2014, our journal has been published quarterly (February, May, August, November) with additional number of page to 100 pages from 50 pages in every edition and the orange peach cover without any picture. In order of internationalization of journal since August 2015, every edition now consists of 50 pages and articles both in Indonesian (Bahasa Indonesia) and English. 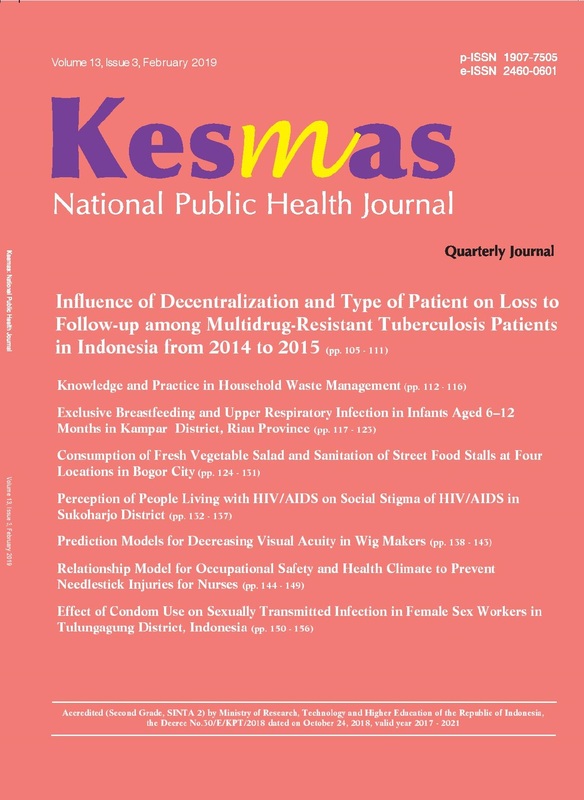 Since August 2016 (Volume 11 Issue 1), we publish journal with the new name as Kesmas: National Public Health Journal consisting of articles in English.